gamerepublic has no other items for sale. 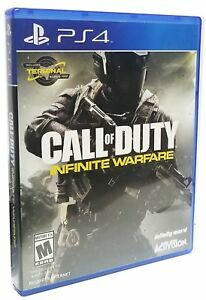 The game Call of Duty Infinite Warfare for the Sony PlayStation 4 gaming console is a first-person-shooter video game with both single player campaign modes and multiplayer modes as well. It is the thirteenth installment of the series. Call of Duty Infinite Warfare is set in the distant future and offers the player large-scale war for the control of the solar system, epic battles, and cinematic, immersive military storytelling and takes players on a journey from Earth to beyond our atmosphere. Very serious seller, totally recommended. Item brand new as described!! Was kind of confused after I ordered an infinite warfare only copy of the game and in the mail showed up as legacy edition. Got my hopes up in thinking I got a steal. Turns out all of the codes inside have already been used. Still happy with my buy it is the right price for only getting infinite warfare. Although we all know that the COD series has departed from the original setup and environment, I don't really dislike that approach. This one is more into space and sci-fi, which is what I'm really into. Top notch graphics and amazing sound (If you have 5.1 or 7.1) will put you in an addictive game play. Story is good but not that deep or emotiona, voice acting is superb, controls are solid. The campaign story is however short and easy, and that's disappointing. The gameplay is also repetitive, no plot twists in the story and no surprises. I think it's best if you either rent the game or borrow it from a friend, then beat it and return it, unless you're into multi-player gaming, this game requires PS+, what the? Campaign and Zombies are a 10/10. Took me a long time just to try this game out because I am not really a Science fiction fan and I wish I would have gotten on the bandwagon earlier. The campaign is bananas. The online zombies is funner than all hell as I'm sure the other online multi-player is as well I just haven't gotten a chance to delve into that part of the game yet. For the price of 15$ I paid you will not find a funner game and I'm looking forward to buying the season pass and getting into more of the online multi-player. This is the first COD I have played since modern warfare 3. It is much much different and takes getting used to. It is really advanced with futuristic features and takes getting used to. But I have played it a handful of time and now am getting pretty good. Love the game and really excited for the next one to come out!! What to say .lets Start with the short scripted campaign mode . Cue cut scene and follow me till we find a group of baddies and shoot them . cue cut scene and repeat . Just boring .The graphics are really nice in the campaign which can not be said for the multiplayer . What a mess this is . poor graphics ,bad spawn points, Weapons all the same , small maps .Qucick scoping is back so be prepared for a bunch of newbies shooting you without even aiming .Zombis modes is so boring . be prepared to wander around a lame looking theme park set in the 1980s. It would be a good idea but thers nothing to do it's a boring grind fest. This is not an enjoyable game .Day one sales are less than 30% of the last COD game .